The Championship Trophy at the St. Pius X Christmas Classic is named in honor of Monsignor Richard Lopez. 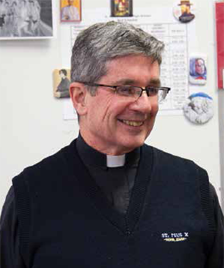 Monsignor Lopez was a teacher at St. Pius X from 1981 to 2013. During that time there was no one who has had a greater impact on the St. Pius X community than Monsignor Lopez. Monsignor Lopez was born in 1944 in New York City. At the age of 10 he moved to Fort Lauderdale, Florida. After high school he attended Eckerd College in St. Petersburg, Florida, where he graduated with a degree in Language. He then entered the seminary at St. Louis University. He was ordained on April 28, 1973 at Cathedral of Christ the King in Atlanta. Monsignor has been very active with Birthright. He serves on their International Board. He was also the chaplain at Our Lady of Perpetual Help Home for nine years. He currently serves as an in-residence priest at Cathedral of Christ the King in Atlanta. More, however, than the positions he holds or the jobs he performs, Monsignor's influence stems from the person he is. He sees the goodness of God in every student he teaches. Every student, in turn, feels touched by God through him. The trophy is so named in order that we may honor him and in a small way say thank you for the blessing he has been and continues to be. The Boys' Most Valuable Player (MVP) Award at the St. Pius X Christmas Classic is named in memory of Mark A. Jardina. Mark was a student at St. Pius X, graduating in the Class of 1988. During his four years at St. Pius X, Mark was a wonderful friend to many, a great student, athlete and a valued teammate. 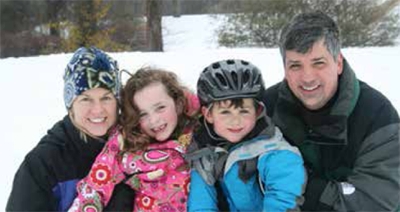 Mark was born and raised in Atlanta, the fifth of six children, who all attended St. Pius X between 1977 and 1989. His parents are Angela and Phil Jardina, and had one sister and four brothers: Mary (‘81), Mike (‘82), Paul (‘83), Matt (‘85) and Larry (‘89). Mark attended the Georgia Institute of Technology, graduating from the school of Management in 1993. He was successful in business during the years that followed, including a stint at the JJ Jardina family produce business. Mark married Joanna Mitchell, a native of Eufaula, Alabama, and brought two wonderful children into this world, Annie (13) and Luke (11). He was involved in the community, cared about those around him, and cared deeply about his Catholic faith. He was an active member of the Cathedral of Christ the King. While Mark was a multisport athlete at St. Pius X, he was best known for his skills as a basketball player. He was a tenacious competitor, a supportive teammate, and never saw a shot that he didn’t like on the court. And he made a great deal of them too! Mark played the game with passion, sportsmanship and competitiveness, and truly made his team better. Mark's legacy and love of sports lives on in the Mark A. Jardina Foundation, an organization whose mission is to support and develop programs in underserved communities that enhance lives through physical activity. The Jardina Family is honored to have “The Mark A. Jardina MVP Award” named in his memory. This award is to honor him and all that he meant to the St. Pius X community, and for the many blessings his life bestowed on us all. Thank you. The Girls' MVP award for the St. Pius X Christmas Classic Tournament is named in honor of Megan (Callahan) Ryan, St. Pius X Class of 1989, where she was a standout athlete in soccer, basketball and volleyball. Megan was devoted to St. Pius X and Catholic education, having been the chairman of the St. Pius X Math Department. She also served as the head coach for the women’s basketball and soccer teams, where she led the school to its first state championship in women’s soccer and the basketball team to the elite eight. She later served as the Director of Admissions and Assistant Principal of Blessed Trinity High School, and coached that school to a soccer state championship as well. She was twice named GHSA state coach of the year. Between her time as a student and teacher/coach at St. Pius X, Megan graduated from the University of Richmond, and obtained a Masters in Education from the University of Georgia. It was while at St. Pius X that Megan met many lifelong friends, as well as the one true love of her life, fellow coach and teacher, Tom Ryan. Together they shared a love of sports and education. 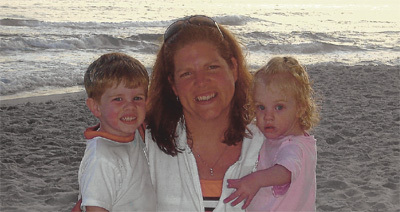 Tragically, when her children (son Johnny; daughter Maura) were very young, Megan was diagnosed with cancer. After a courageous battle with the disease, she died in 2007. Tom, who coaches football and teaches at Blessed Trinity, continues to raise their two children in the spitting image of their mother as great Catholics, student athletes and friends to everyone they meet. While playing for St. Pius X, Megan was named the DeKalb County Player of the Year in basketball. She approached sports in the same manner she approached life; with determination, love and passion. Her number one priority as a coach was to instill the same attitude in her players, which was evidenced in her team’s success, and in the current success of the many young women and students she influenced. Megan was born the ninth of 10 children. She was a loving sibling who provided significant care and dedication to her older sister, who was paralyzed from neurofibromatosis. The Callahan tradition at St. Pius X began in 1968 and continued for two generations until 2007, with 13 graduates. Her parents’ legacy remains through the Mary Byrne Callahan Scholarship and Endowment. The entire Ryan and Callahan family wish to thank all of Megan’s friends and former colleagues, players and students who contributed to and supported this honor.